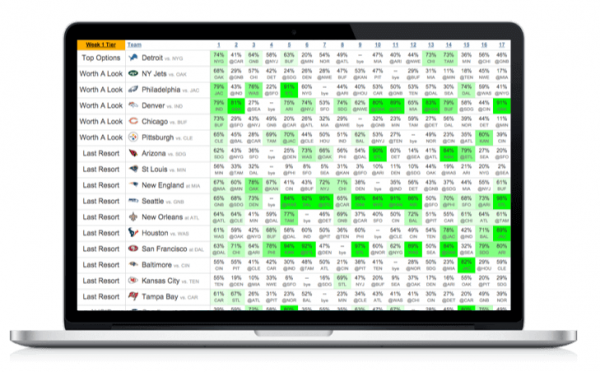 After reviewing three principles of winning football pool strategy and exploring how the pros use game theory to profit from football pick’em contests, let’s dive into NFL survivor pool strategy. What Is An NFL Survivor Pool? In the most basic format of NFL survivor pool (also known as an eliminator pool, knockout pool, suicide pool, or last man standing pool; talk about an identity crisis! ), you simply need to pick one team per week. If your pick wins its game, you “survive” until the next week and get to pick again. If your pick loses its game, you’re out of the pool. The twist, however, is that you can only pick each team once per season. Play it safe with the Saints in Week 1 this year, and you won’t be able to use New Orleans as a pick again. Last season, our subscribers reported winning over $1 million in NFL survivor pool prize money. Here’s how they did it: NFL Survivor Picks. The constraint of only being able to pick a team once transforms survivor pool pick strategy into an amazingly complex and scary beast. The good news is, complexity is only a bad thing if you don’t have the skills and tools to navigate it. With the right data and analysis, you can give yourself a big edge over survivor pool players who don’t understand winning strategy. And more than anything else, the concept of value-driven picking is what separates the sharp NFL survivor players from the noobs. In this post, we’re going to explain what it means to pick for value in survivor pools, using the “Holy Trinity” of team data: win odds, pick popularity, and future value. In that case, your optimal pick strategy would be simple. To maximize your odds to win a prize, you’d just pick the biggest favorite of the week in each of the first five weeks. You wouldn’t care about any other team, and it wouldn’t matter which teams your opponents were picking. That’s not how survivor pools work, of course. But many players act like it is. Their pick decisions, especially in the early weeks, are more aligned with achieving an arbitrary goal like making it to Week 7, or minimizing the chance of getting eliminated in the first three weeks. They completely lose sight of the fact that the only goal that matters is to survive at least one week longer than all of their competitors. That difference may seem subtle (I mean, won’t I probably have to survive until at least Week 7 in order to win my pool? ), but the implications on pick strategy are huge. When a new season of NFL survivor pools kicks off each September, unless you’re in a huge pool where at least someone is likely to survive all 17 weeks, you really have no idea how long you will need to survive in order to win. For emphasis: In 2015, just three seasons ago, the average 10-entry NFL survivor pool was over in Week 2. So if you want to play survivor pools like a pro, the first myth you need to dispel from your mind (again, with the exception of huge pools) is that you’ll need to survive some arbitrary number of weeks in order to win. Just because your pool’s winner has made it to at least Week 12 in each of the last two years doesn’t mean it’s going to happen again in 2018. To maximize your edge in an NFL survivor contest, you instead need to focus your attention on identifying the specific pick opportunities that give you the best chance to beat your opponents. That means you need to evaluate pick decision through a value lens (in short, understanding the relative risks and benefits of picking against the crowd) as well as a survival lens. Win odds are the most basic element of winning survivor pick strategy. It is, after all, a survivor pool, so it’s paramount to understand that the Saints (9.5 point favorites at post time) have about an 80% chance to beat the Bucs in Week 1, while the Rams (3-point favorites at post time) only have about a 60% chance to beat the Raiders. It goes without saying that the higher a team’s win odds, the better. All else being equal, you’re better off picking a team that’s more likely to win. We use a combination of betting market odds and data-driven predictive models to calculate objective win odds for every team. Usually, though, all else is not equal, and other factors such as pick popularity play a big role in determining optimal pick strategy. Many survivor pool players do not fully appreciate the impact that pick popularity has on their chances to win a pool. They focus so much on picking the “safest” team that they forget there is only one way to win a survivor pool: You need to get a pick right while your opponents get their pick wrong. That means while safety is important, identifying choice opportunities to pick against the crowd is also critical to maximizing your edge. (We gather data from multiple survivor pool hosting sites to estimate pick popularity each week.) Sacrificing a few percentage points of safety to pick a team that is much less popular will often increase your odds to win a survivor pool. For example, if you think half your pool is going to pick the Saints in Week 1, then it almost certainly would be foolish to pick them. As of post time, four other teams in Week 1 had win odds of around 70% or greater (not that much lower than the Saints), and one or two of those teams would likely be very unpopular picks in your pool (maybe only 5% of players would end up picking them, compared to 50% pick popularity for the Saints). Those unpopular, almost-as-safe teams would likely make great picks. To show you why, let’s introduce the concept of Current Week Expected Value, a metric that combines both win odds and pick popularity. The concept of expected value (also referred to as “EV”) considers all the potential outcomes of making a particular survivor pick. Instead of only looking at risks (e.g. the fact that Minnesota is less likely to win its Week 1 game than New Orleans), it also factors in potential rewards (i.e. what if Minnesota ends up winning and popular New Orleans ends up losing?). Here’s a simplified example of how it works. Let’s say you enter a 1-week long survivor pool during NFL Week 1 with 9 other people. The prize pot is $1,000, and the pot will be split equally among any players who survive the week. If no one survives, you play the same game again next week. However, you can only pick the teams playing in one game: 49ers at Vikings. The Vikings are favored by 6 points, and historically teams favored by 6 points win about 70% of the time. Should you pick the Vikings or the 49ers in this 10-entry survivor pool? If you’re a smart player, the first thing you’d do is try to project what your opponents are going to do. The table below shows the expected value of different scenarios, based on certain numbers of your opponents picking the Vikings vs. 49ers. Since it’s highly unlikely that all or almost all of your 9 opponents will pick the underdog 49ers, we didn’t list out all the potential scenarios. Again, “EV” stands for Expected Value, which in this case is the expected payout from the $1,000 prize pool in each scenario. If your goal is to maximize your expected profits from this survivor pool, you need to at least consider picking the underdog 49ers. Wait, you say, that’s crazy! In a survivor pool? They’re not even a favorite! But just look at the numbers in the able above. If you end up being confident that 2 or fewer of your 9 opponents will pick the 49ers (which seems plausible), then picking the 49ers offers a higher expected payout. Yes, the Vikings will win the game more often. But when the 49ers do win, you’ll win a solid portion (and maybe all of) the prize pot, vs. having to split it 7 or 8 or 9 ways. Decisions like these take guts, and it’s also true that some people simply prefer to win less money more often, vs. hitting a bigger payout less frequently — even if the latter option nets them more money in the long term. However, if you’re committed to playing in survivor pools for years to come, making some contrarian picks like the 49ers here will very likely pay off. Even players who understand the concept of picking against the crowd tend to ignore it in the opening weeks of NFL survivor pools. A common strategy is to wait until later in the season to start making riskier picks, and focus exclusively on maximizing survival odds in the early going. If you do that, you could miss the best opportunity of the 2018 season to watch a big percentage of your pool get eliminated while your pick wins. What if it’s only Week 2 when an amazing opportunity to make a contrarian pick presents itself? An opportunity that, while a bit riskier than picking the safest team, offers the possibility of nearly doubling your chances to win the pool if things play out well? If you’re too timid to exploit an opportunity like that whenever it presents itself, you will lose a ton of edge in survivor pools. Of course, most survivor pools don’t last just one week. That brings us to future value, the final component of the Holy Trinity in addition to win odds and pick popularity. The concept of future value in survivor pools is pretty easy to understand in theory. When you “burn” a very good team by using it as your survivor pick in a given week, you typically increase your odds to survive the week (good), but you then no longer have that team available to use in the future (bad). However, coming up with a precise understanding of every team’s future value gets very complicated, very fast, because future value isn’t determined only by how good a team is. To figure out the true opportunity cost of using a specific team as your survivor pick in a given week, you first need to consider all the remaining games that team still has to play, and determine in how many future weeks it is likely to be a legitimate survivor pick option for you. Even elite teams will have some tough future matchups (e.g. the Patriots visiting the Steelers in Week 15) where their win odds won’t be high enough to make them a viable survivor pick consideration, no matter how unpopular they may be. For this reason alone, many survivor pool players incorrectly assume a good team has more future value than it actually does. In addition, you need to evaluate the universe of pick options in every future week. In some future weeks, there may be only one or two teams projected to have highly favorable matchups, and you’ll put yourself at grave risk if you burn those teams earlier. Even mediocre teams can have fairly high future value, if they happen to be one of the only teams with a good matchup in a future week that’s largely devoid of them. Evaluating a team’s future value goes even further, though. Ideally, you are also considering how many of your opponents have already used each team, and using that data to predict which teams will be be the most popular picks in your pool in each future week. Amazingly, we’re still not done. A team’s future value is also dependent on your pool size, and consequently, how long your pool is expected to last. For example, the Vikings may end up being the biggest favorite of Week 15 this year, when they host the Dolphins. But if you’re in a 15-person NFL survivor pool, odds are your pool will be over by then. So there’s no point in giving Minnesota a lot of future value credit for that matchup in that small of a pool. As the previous section hopefully illustrates, survivor pools are amazingly complex games. Figuring out your optimal pick strategy takes a lot of data and math, and there’s no simple formula for doing it. If there were, these pools wouldn’t be nearly as much fun. The goal of this post was to explain some of the concepts behind making survivor pool picks with a value oriented approach, and not just a survival oriented approach. The weekly pick that gives you the best chance to win your survivor pool may still end up being the safest pick of the week — but that’s not the point. The point is that figuring out your optimal pick requires an objective and precise understanding of win odds, pick popularity, and future value for every team. Do all that well, and you should reap handsome long term profits from survivor pools. After researching survivor pool strategy for years, we engineered a solution that does all the necessary data gathering and math required to identify the best survivor picks for your specific pool. It’s the only product that algorithmically optimizes your weekly pick (or picks, if you’re playing multiple entries) based on the Holy Trinity of survivor pool strategy data. It even factors in which teams you’ve already picked, and adjusts pick recommendations for common rule variants like having to make multiple picks per week later in the season. In short, everything we wrote about in this article, this product does. We invite you to check it out: NFL Survivor Picks. This concludes our Football Pool Strategy series for 2018, though we may add more articles in the future. We hope you enjoyed it, and learned something along the way.